The digital Mark V LIM was designed in accordance with NFPA 99 Healthcare Facility Code requirements to offer the best functionality and newest technology for our users. Created with the user in mind, the Mark V LIM offers an on-board status digital display and event logging and communication capability. The prominent LCD display instantly communicates important information such as line voltage, THC range and system status indication. The intuitive user interface menu provides convenient access to view alarm and event logs as well as configuration of user settings. Users can also scroll through past alarm and event logs using the convenient front mounted keys. LCD display (user selectable) and LIM Connect™ is also available in Spanish with a Spanish language overlay. Optional features can be added to display system overload and transformer temperature status with alarm notification available. The Mark V LIM can be networked with PG LifeLink’s LIM Connect™ remote management system and also is compatible with most Building Management Systems (BMS) via Ethernet and ModbusTCP. 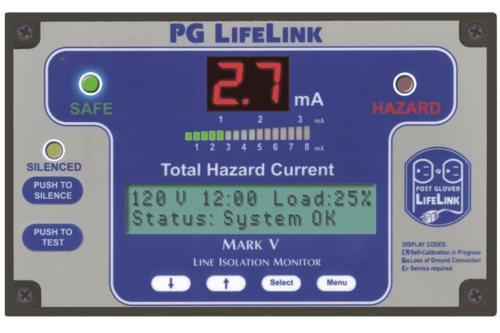 Please note: PG LifeLink has discontinued the manufacture and supply of the Mark IV Line Isolation Monitor (LIM). PG LifeLink will support any warranty claims or direct replacement of the Mark IV LIM with the Mark V LIM. 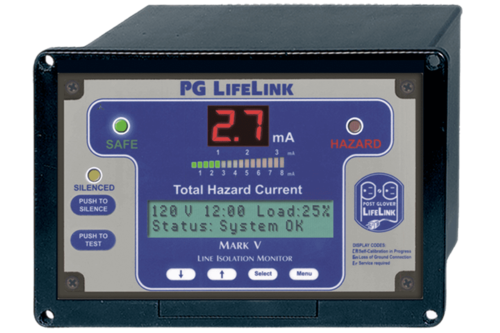 For more information, view the press release or contact PG LifeLink's Service Department at 1-800-287-4132.